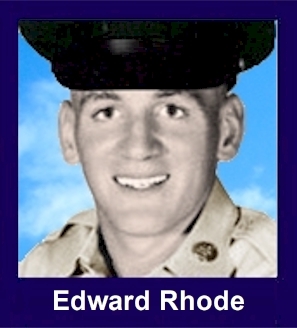 The 35th Infantry Regiment Association salutes our fallen brother, PFC Edward Anthony Rhode, who died in the service of his country on April 15th, 1968 in Kontum Province, Vietnam. The cause of death was listed as Small Arms/AW. At the time of his death Edward was 19 years of age. He was from St. Louis, Missouri. Edward is honored on the Vietnam Veterans Memorial at Panel 50E, Line 7. The decorations earned by PFC Edward Anthony Rhode include: the Combat Medical Badge, the Bronze Star with V, the Purple Heart, the National Defense Service Medal, the Vietnam Service Medal, the Vietnam Campaign Medal and the Vietnam Cross of Gallantry with Palm Unit Citation. I went to HS with Ed. He and I played on the freshman football team together. The guy had tree trucks for legs! about a week before he left for basic training. Then, months later, I heard he had died shortly after having arrived in Viet Nam. Thank you for your sacrifice, Ed. For heroism in connection with military operations against an armed hostile force in the Republic of Vietnam. Private First Class Rhode distinguished himself while serving as a Medical Aidman attached to D, 1/35th Infantry. On 15 April 1968 as the unit moved from LZ Mile High to assist a sister Company in heavy contact with a large hostile force, it received enemy sniper and automatic weapons fire. Eliminating these hostile positions, they pressed forward and were able to join the other element. After securing part of the sister element's perimeter, Private First Class Rhode's comrades maneuvered into new positions to rout the hostile forces. Several of the men were wounded by hostile fire. Private First Class Rhode immediately rushed through the intense hostile fire to reach the casualties positions. Taking cover behind a log, he began administering first aid to his wounded comrades. As the fire fight grew in intensity, others were injured. Repeatedly exposing himself to the hostile fire, Private First Class Rhode moved from one position to another administering first aid and offering words of encouragement to his injured comrades. Moving to treat still another man, Private First Class Rhode was mortally wounded by hostile fire. His courageous dedication to his comrades clearly prevented more serious casualties and greatly aided and inspired his comrades in defeating the hostile forces. Private First Class Rhode's exceptional courage, preserving concern for the welfare of his comrades, and exemplary devotion to duty are in keeping with the highest traditions of the military service and reflect great credit upon himself, his unit, and the United States Army.